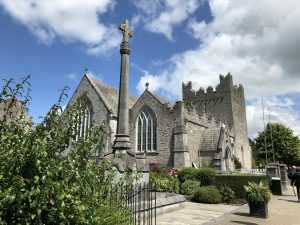 We left Galway and headed south to step back in time by visiting Bunratty Castle and driving past the city of Limerick. We had Holy Mass in the restored church of The Holy Trinity in Adare. 500 years ago King Henry VIII confiscated all of this land from the church and the monastery and killed all the priests and monks. Only in the last hundred years were the Catholics able to regain the church. Then we drove down to the beautiful south west corner of Ireland to stay in a gorgeous hotel out in the country over looking the landscape and sneezi 500 years ago King Henry VIII confiscated all of this land from the church and the monastery and killed all the priests and monks. Only in the last hundred years were the Catholics able to regain the church. You can hear Deacon Tom Collier’s homily here. Then we drove down to the beautiful south west corner of Ireland to stay in a gorgeous hotel out in the country over looking the landscape in Sneem.